The Go Power! Solar Chargers are produced by Carmanah Technologies Corporation. Since 1996, the company has been designing and manufacturing renewable energy and energy efficient products for a wide range of industries. In the process, they have garnered many awards for innovation and customer satisfaction. The company produces several solar chargers intended for recreational vehicles and campers. The Go Power! GP-RV-80 is an 80 Watt solar kit with a 25 Amp digital regulator capable of handling 395 Amps of solar energy. The solar panel is constructed of high efficiency polycrystalline, and the kit includes all the hardware needed to mount the panel on the roof and a 25 foot cable for connection. The unit is designed to provide up to 4.6 Amps of charging power to the battery each hour, or up to 196 Amp hours weekly based on good sunshine. Even on an overcast day, the unit will provide some charging power; one user reported he obtained 1 Amp per hour on a rainy day. Purchasers of the product have stated that the batteries are normally fully charged by ten in the morning, and that it eliminates the worry that long camping trips can generate. The Go Power! GP-RV-95 also has a 25 Amp digital regulator and is a 95 Watt unit. It produces 5.45 Amps of charging power to the battery each hour and an average of 228 Amps weekly. It features a high efficiency solar panel of monocrystalline construction, all hardware need for mounting the panel, and 25 feet of cable for connecting the panel. The regulator can handle up to 395 Amps of solar power. The panel has some charging ability even on overcast or rainy days. This is one of the smallest units, in terms of dimensions, on the market today. Purchasers who have placed these units on travel trailers have been extremely happy with the unit, and appreciate the display which shows battery voltage and how much current is flowing to the battery from the panel. They also state that adding additional panels, if needed, is easily accomplished and does not require replacing the regulator. Go Power! 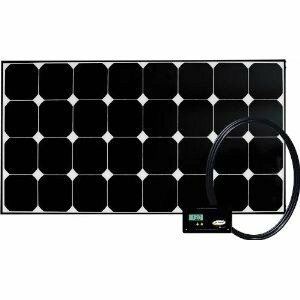 Solar Chargers can be more expensive than comparable units made by some other companies. This is especially true if suggested retail is paid. However, there are sites online that offer the units at a deep discount, making them more competitive from a price standpoint. I have 4 6volt batteries hooked in series I would like to know how what I would need as far as a system goes to keep them charged while stored ? They put out about 225 amp hrs. each.